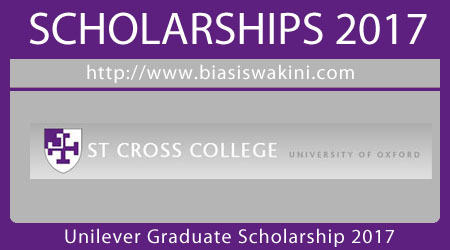 St Cross College invites applications for this scholarship 2017 from students who will begin studying for a DPhil research degree in the sciences at the University of Oxford in the academic year 2017-2018 and who list St Cross College as their first choice college on their Graduate Admissions application. The Unilever Scholarship in the Sciences has a value of £3050 and is tenable for three years coterminous with College fee liability. The successful scholar will be guaranteed to have a room in College accommodation (at the standard rent) for the first year of their course. Preference will be given to those studying for degrees in engineering or biochemistry. Applications should be received by Friday 19th May 2017. Written requests should be sent to the Academic and Admissions Assistant, St Cross College, St Giles', Oxford OX1 3LZ. 0 Komentar untuk "Unilever Graduate Scholarship 2017"